Leaving Banff, Alberta; we drove to Calgary and then south to Milk River, which is very close to the US. border and Montana. This would be our last stop in Canada before heading south to Yellow Stone National Park. Writing-on-Stone Provincial Park is a small nature preserve (18 sq. km.) that straddles the Milk River. It contains the greatest concentration of rock art on the North American Great Plains. We spent the night camped here near the river. The next morning I was up early to paint and managed to do a couple of good sketches. The Mule Deer that live in the camp ground make easy subjects as they allow you to get reasonably close. I was also fascinated by the sand stone formations called “Hoodoo’s” that make an interesting subject to paint and sketch. Some of these formations look like other worldly creatures. The Blackfoot Peoples considered this place very sacred and were probably the ones who created many of the rock carvings and paintings. spirit that was instilled in me from a young age. Along with painting in watercolour, I spent many summers working as a white water rafting guide in Western Canada. The picture above shows me guiding in Bow Canyon, on the Bow River in Alberta. It’s been a few years since I hung up my paddle as it relates to river guiding but the spirit of adventure, exploring and travel lives on. 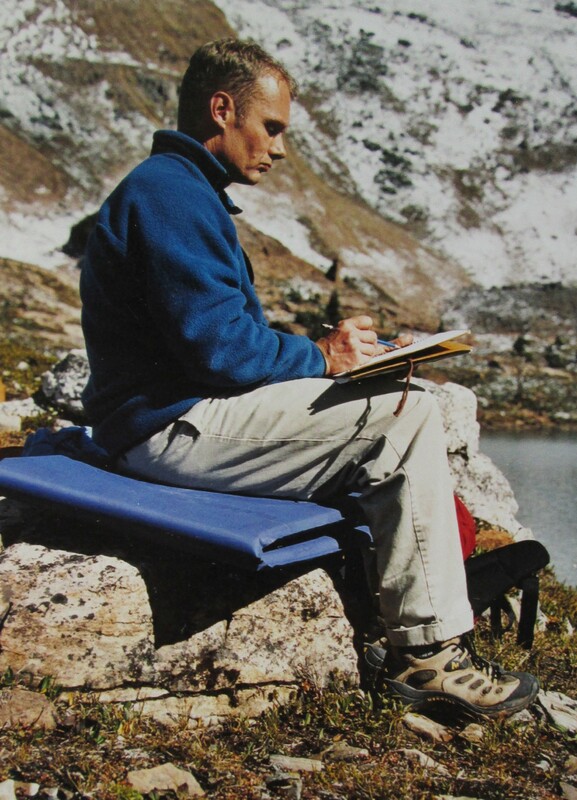 My watercolour paintings and sketches are often scenes of Canadian wilderness, however I also love to paint my travel experiences and adventures world wide. What I hope to share with people is the beauty I see along the way with a special emphasis on Canada. I grew up with a fascination and respect for a group of Canadian painters called the Group of Seven. They painted Canada in a style that show cased Canada as a rugged land of lakes, rivers, mountains and forest. This is a big part of what Canada still is and I would like to be a part of that tradition of painting this great land. The idea behind my blog is to share with you my journey of painting in watercolour. When I couple this idea with my love of travel, hiking and fascinating places, I feel their is no end to this adventure. I would like to think that there is value in sharing thoughts and experiences and so I welcome your comments.